Every year we make New Year’s resolutions with great intentions and on January 1st we try and stop our old habits cold turkey. Why do we start trying to make major life changes smack dab in the middle of the busiest time of the year? I don’t know about you but I always have a lot going on with family, work, and the holidays so its tough to suddenly introduce big new life changes right in the middle of it all. This year I propose something different – this year I challenge you to get a head start! Pick one thing you desperately want to change in your life, only one thing so you can keep focus. Something you want to change more than anything else. Now commit to working towards that change beginning today. Rather than waiting until January 1st, get a head start. When the first of the year rolls around and everyone else is starting fresh on the first day of their New Year’s Resolutions, you’ll aleady have a whole month under your belt. When your friend’s talking about how they’ve lost 5 lbs by the second week of January, you can just smile to yourself and think about how you’ve already lost 2–3 times that much. When everyone else is struggling to get past that rut in the third week of January, you’ll have a huge advantage over them. You’ll have momentum behind you! You will have been living your new habit for almost two months and will definitely be seeing some results. They say if you do something seven times in a row it starts to become a habit. So by January 15th, it’ll have been 45 days, plenty of time to make it a part of your routine. You’ll have beaten back the cold sweats and major urges and be on a roll. You may even be doing well enough that you can start working on a second change. Many people can’t even see one New Years Resolution through, you might even be able to knock out two! I’m sure the Beastie Boys weren’t singing about the month of December when they sang about “Sabotage” but if you have resolutions about losing weight or getting your finances back on track then December is definitely the month of sabotage. With holiday shopping and cookies galore the last month of the year can be a total disaster. It’s a time of overindulgence both financially and from a calorie perspective. If you spend December spending way too much money and eating tons of treat, then January 1st you’ll be in the hole. So make that change December 1st. Reign in your spending or the number of calories you’re eating and you’ll have a major head start on January 1st – instead of being behind before you start. I don’t know how many people I’ve known (myself included) who started a new diet January 1st but spent the last two weeks of December stuffing their face because they know they won’t be able to in January. Obviously the problem is you put on an extra five or ten pounds before your new diet even starts so you start out fat and discouraged. The same goes for spending. If you go bezerk with Christmas presents you could off on January 1st with major debt – or at least some big bills to pay. Just look at the picture at the top of this post. Who would you rather be January 15th? 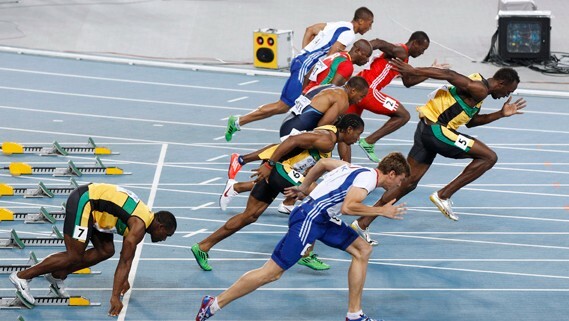 The guy out in front with an advantage or the guy who hasn’t left the blocks yet? Another problem we run into is that we begin January 1st and expect everything to go perfectly. Often a major life shift requires significant changes and if we haven’t thought these through we can run into some serious resistance when we implement our new self. By starting a month early you’re actually able to work through those issues and address them now so when the New Year does roll around you’ll have already figured out how to incorporate those changes into your life. So, my challenge to you is to get a head start this year along with me. For all of December and January, I won’t eat any sweets. No cake, cookies, candy, ice cream, pie, or anything sweet. I’m going on a sugar embargo during the holidays and beyond. Just like the basics of personal finance are simple (spend less than you earn) the essence of losing weight is also simple (burn more calories than you eat). So the second part of my change is that I’m starting to exercise twice a week (I know it doesn’t sound like much but it will be twice as much as I’m exercising now). That’s my head start. What’s yours? For me it’s a financial goal that I’ve got in mind. I think you offer some excellent advice in terms of building momentum in terms of achieving the goal in mind. This is a fantastic idea! I think you make an excellent point about starting a month in advance, and I also like what you said about only focusing on one major goal. You are more likely to accomplish it when you are focused 100% than to split the focus 5 different ways. Good luck on your no sugar goal!